Hello Doodlebugs! 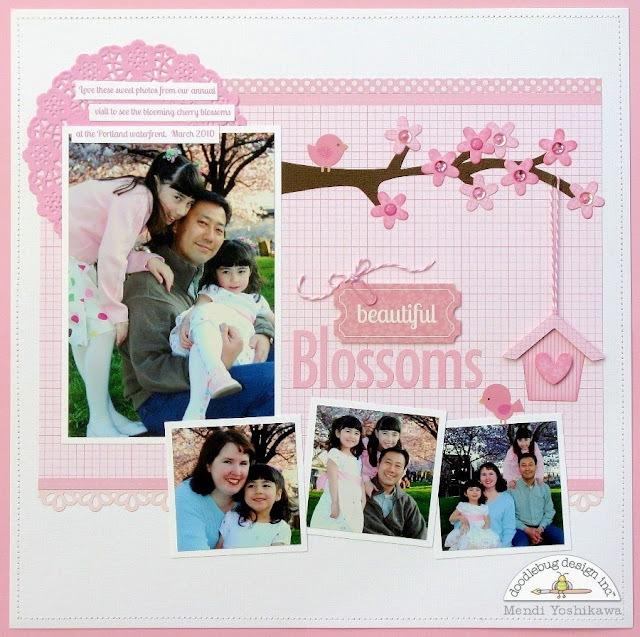 It's Mendi here today with a layout focusing around Doodlebug's Cupcake color! The soft pinks found in the cupcake color group are so pretty and were the perfect compliment for my cherry blossom photos. To create my layout I used a fun sketch by Allison Davis at Scrapbook Generation and pulled out as many things I could think of in the cupcake color. As I was creating I kept thinking of more items I missed (like washi tape, buttons, brads, clothespins, paper clips, pearls & paper frills to name a few). For my tree branch and flowers I used Doodlebug's new Sizzix Tree with Flowers, Heart & Leaves die. I simply cut the branches apart and pieced it together to lengthen it. For the flower centers I alternated jewels, glitter sprinkles and sequins topped with mini pearls. I love the sparkle it gives my page! A little birdie sticker from the Sugar & Spice icon sticker sheet was the perfect finishing touch. For my title I paired the "beautiful" sticker from the Kraft In Color Sticker sheet with the new Cupcake Skinny Alphas. For my twine bow I was liking how the tails were naturally falling and I wanted it to stay like that so I used a glue pen to adhere it to my paper. I cut my little birdhouse out on my Silhouette using THIS cutting file and was able to hide the knot for my baker's twine by sandwiching it between pieces foam tape under my roof. For my heart, I used a die-cut from that same Sizzix die. Such an adorable layout. 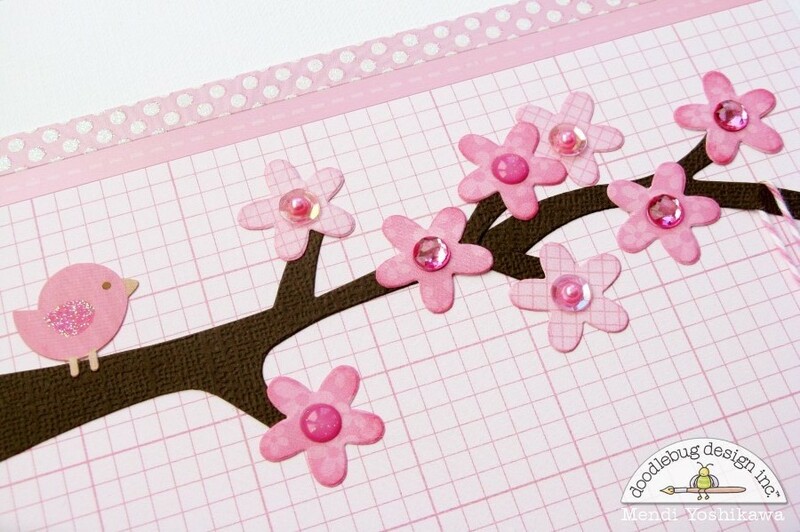 Love how you used the tree die-cut as a branch. Love the beautiful layout! All the elements look so great together, and I can't believe your pre-planning -- making sure that all your clothes color coordinated with each other and the intended backdrop! WOW! Sure makes for a gorgeous page. OMG Your Layout is absolutely the most beautiful layout I've ever scene. Your pictures are ever so precious...you so scrapped them in a way that you so showcased them so perfectly and definitely in a way that tells your sweet story. You are a very talented scrapper. Thanks for sharing a most sweet time in your life. YOU ROCK!! This is just beautiful Mendi!! 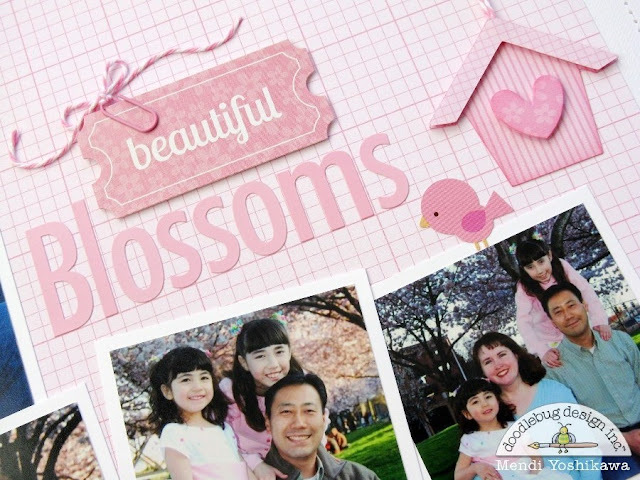 You have amazing scrapping skills and such a lovely family! This Lo is so beautiful Mendi!!! Love, love your work!!! Amazing and SO, SO beautiful!! Love seeing all the awesomely yummy and fun cupcake colored goodies here on this lovely, incredible layout! !